In a practice — raising one’s own food — that’s full of satisfying activity, there’s little as satisfying as planting fruit trees. Fruit trees planted this season will, in a few years, provide us a lifetime of nourishing harvests, harvests that we will enjoy with our children, harvest that, with the right care of our trees, will nourish their children as well. And there’s hardly a more joyful experience than picking a ripe plum or peach or apple or handful of cherries and enjoying them right there in the shade of your own orchard. Depending on where you live, you’re probably in the last days of spring fruit tree planting. Simple rule of thumb: it’s safe to plant up until established trees have leafed out and finished blooming. Yes, you can stick trees in the ground for a few weeks after this but remember: the later in the season you plant the slower your trees will develop. Backyard trees are important components of your landscape. With our selection of tree care products — from soil amendments to pruning tools — you can give them the attention needed for strong growth and maximum production, not only at planting, but for a lifetime. Got bugs? Click on our Orchard & Tree Problems page for insect descriptions and a list of earth-friendly remedies. Your local nursery, extension agent, or amateur orchardist is probably the best source when choosing which cultivars of different fruit types to plant in your area. They’ll know things like whether or not there’s too much cold for a certain cultivar or not enough. They’ll know which type of fruit best handles your particular moisture, soil and summer weather conditions as well as which ones are best equipped for the pests and diseases endemic to your area. Advice of this kind can prevent suffering for you and your tree down the road. If it’s too late to plant in your area such as areas of the south where planting is best done in fall or winter, it’s not too early to begin gathering such information now so as to be ready for next planting season. When choosing a place to plant your trees, consider the micro climate. Trees need 6-8 hours of light a day for best harvests, so don’t plant your orchard on a north facing slope that sees little sun outside the late spring and early summer months. South facing slopes can be ideal, especially as they provide good drainage. You don’t want to plant trees sensitive to cold at the bottom of hills or in declivities where there is cold air runoff or sinks. You can usually spot such places by the way they tend to gather and hold frost. Because light is so important, you’ll want to consider the quality of the light your trees will receive. Eight hours of sunny California light is different than eight hours of cloudy light in Seattle. While even cloudy days provide enough light (planting trees in shade is another thing all together) you’ll want to plant your trees where the light is most available. If you live in hot, sunny climate, providing occasional or broken shade is a plus. Healthy soil is the key to healthy trees. It’s a good idea to work the soil where your trees will go well ahead of time, mixing in compost, supplying nutrients and encouraging the living organisms that will help your trees resists pests and diseases. Mulching the spot ahead of the time you plan to plant a tree encourages such organisms, as is mulching around the tree once planted (but see consideration below. Once you’ve obtained the trees you will plant, try to get them into the ground as soon as possible (trees that come in pots with soil can be held for several days; bareroot stock should be place in a bucket of water for three or four hours ahead of planting). Cut away any dead roots you may find or any exceptionally long roots at a length that will allow your tree to sit without root twisting inside the hole you’ve dug. Generally, you’ll want to make your hole as deep as the root ball of your tree extends. It’s also a good idea to break up the soil as best you can at the bottom of the hole and then throw in a shovel or two of compost to introduce living organisms and encourage good growth. But don’t add fertilizer. That comes after your tree has had a chance to become established. All the riches of the earth! Black Gold® Organic Compost provides organic matter and natural nutrients for flowers and vegetables — improves soil texture and structure. Includes Canadian sphagnum peat moss and forest humus to increase vegetable yields and flower blooms. Does NOT contain sewage sludge or biosolids. Different types of fruits and berries require different soil conditions and pH readings. Consult your local nursery or extension agent for the best growing conditions. 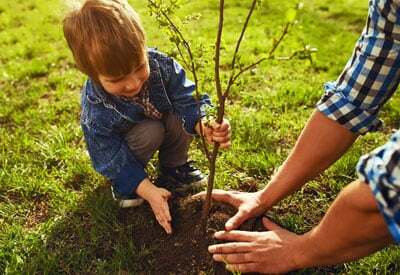 My grandfather showed me how to shake the tree gently as the soil is added to the hole (take a cue from grandpa: this is a good activity for one of your children as you shovel in the soil). The idea is to make sure there are no air pockets around the roots. The root ball of grafted and clonal trees may be larger on one side or another. It’s a good idea to face the tree so that the root ball is on the side of the prevailing winds. This will help anchor the tree as it grows. Staking the tree is also a good idea, especially in windy areas. Firm the soil at the top and be sure to add an extra three inches of dirt at the top. Also, water like you mean it (you might want to do this ahead of adding that last crown of soil). Five gallons of water for a new fruit tree isn’t too much. The idea is to make sure the tree roots have enough moisture to prevent planting shock. If you’re mulching around your newly planted tree — a good idea to allow for moisture retention and soil organisms — leave a good two inches between the trunk and the edge of the mulch. You wouldn’t want to encourage rot or disease. Once your tree is in the ground you’ll want to trim back some of its branches and or leader, especially if you’ve trimmed roots before planting. Roots are also trimmed before shipping to nurseries (or directly to you) and if this has been done, trimming back branches can also be a good idea. Proper training and pruning of trees is a book-length subject. Here’s a start (PDF) from the Alabama Cooperative Extension Service. More good tips can be found here, compliments of the Penn State Extension Service. Make sure your newly planted tree gets enough water — springtime weather often takes care of that — and then keep a close eye on it. In a week or two you’ll start to see signs of growth which indicate, as grandpa used to say, the tree has begun to “take,” signaling a lifetime relationship between it and you.